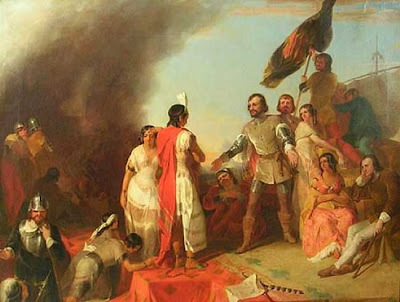 The surrender of Prince Guatemozin to Hernando Cortes by the American painter Peter Frederick Rothermel (1817-1895). Rothermel shows here the last decisive vivtory of the Spanish conquistador and claims him as a predecessor of US-American history. Cortez appears as a merciful forgiving victor. Maybe it should therfore be mentioned that Guatemozin was later tortured and executed.